I just got a press release from UGA's Gameday Gameplan team. They are shrinking the Family Friendly Zone on South Campus. ATHENS, Ga., Sept. 20, 2006— Fans will have a chance to run, jump, catch and throw with top UGA athletes before the next home football game. Prior to Saturday’s game with Colorado, student-athletes from four other UGA teams will be at the family-friendly areas to interact with fans and sign autographs. One family-friendly area is located in the North Campus quadrangle between Old College and Broad St. 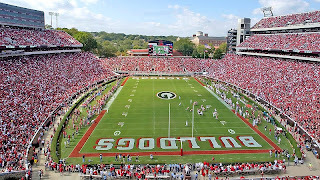 There fans will be able to meet athletes from the UGA track and field and cross country teams. The teams will be there from 10:30 to 11:30 a.m., signing autographs and mingling with fans. In addition, 10 members of the UGA cheerleading squad will be there from 9:45 to 10:15 a.m. to rally fans. Kick off against Colorado is scheduled for 12:30 p.m. The South Campus family-friendly area is located on the front portion of D.W. Brooks Mall in front of the Miller Plant Sciences Building. This location has been condensed to allow for more traditional tailgates along the greenspace, according to George Stafford, associate vice president of auxiliary and administrative services. At the South Campus location, the defending SEC Eastern Division Champion Georgia Bulldog softball team will be joined by the nationally ranked men’s and women’s swimming/diving teams from 10:30 a.m. to 11:30 a.m. on Sept. 2. Ten members of the UGA cheerleading squad will be joined by 20 members of the pep band from 9:45 to 10:15. Note: It's good to see that UGA is being somewhat reasonable in evolving what was a terrible idea. It's progress. We still don't need as much of North Campus reserved for all of this non-sense, and it's still not about booze. It's about litter. That said, I'm pleased that some progress is being made in balancing the situation. For those that aren't familiar with Brooks Mall, it is basically broken into two parts. The front part = no booze. The back part is roughly the same size. It will be a bit harder to lug tailgating equipment back there, but it's progress. Ideally, they would flip the two areas. But something is better than nothing. More progress is still needed. Now all we need is for the powers that be to either move the North Campus FF Zone to the intramural fields or just totally do away with it. Westerdawg, I give you total credit for the retreat by the Adams Regime. Your video made this half-assed implementation of a half-assed idea the laughing stock of the Bulldog Nation. Why not put the Leebern-free zone at the upper practice field right next to Butts-Mehre? The band practices on the lower two, but the upper one isn't as far away as the intramural fields so it's easier to get to. Either way, your video was the Bulldog version of Thomas Paine's Common Sense. Pamphleteering in the digital era still works. Keep the heat on. One day, this too shall pass and the scourge of Michael Adams will be no more. We're now pimping out other student-atheletes to improve attendance in these areas? Good grief. Yay for the square-footage useage reduction. But honestly. Keep the heat on PWD and all tailgaters!!! You're right, a little bit is better than nothing. Plus, it shows they know their plan has failed, big time. I just hope those that do tailgate in the now relieved ares pick up their trash - maybe more concessions will be made. And the numerous quotes from the We'll Never Get It Administration continue, "we feel like traditional and family-friendly tailgating in this area can certainly be accommodated.” For the love of God, people who drink beer also happen to be traditional in nature as well as family friendly. What man brings his kids with him to a football game and doesn't covet the first cracked beer? I still want Adams fired and all this nonsense stopped! I am still withholding my yearly donation to UGA until he's gone!